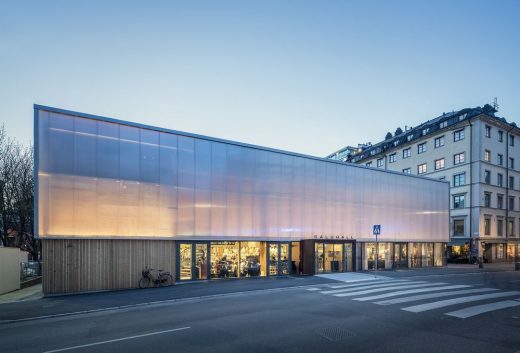 Östermalm’s Temporary Market Hall Stockholm is one of 40 shortlisted works competing for the 2017 European Union Prize for Contemporary Architecture – Mies van der Rohe Award, announced by the European Commission and the Fundació Mies van der Rohe. 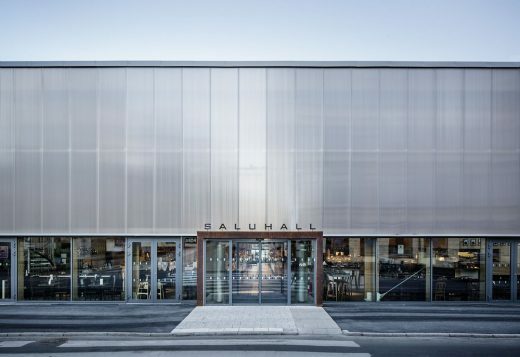 The historic Market Hall is in desperate need of modernizing and during the period of its refurbishment there was a need to create a temporary Market Hall on the adjacent square. 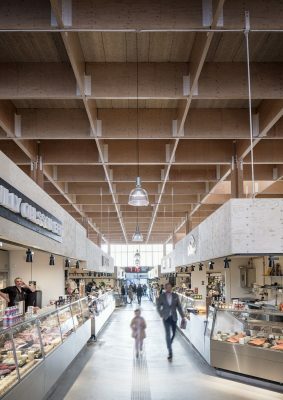 The temporary structure has been a popular success with almost twice as many visitors per week as the historic Market Hall and an increase in the trader’s turnover of up to 50%. 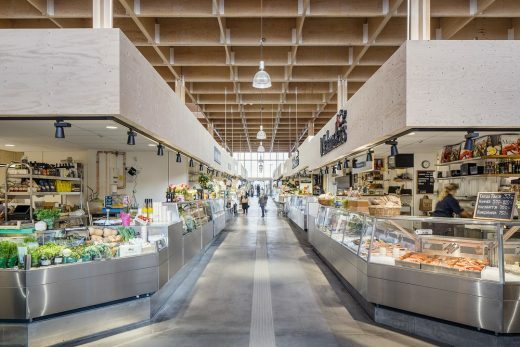 The Temporary Market Hall is located in Östermalm, an affluent neighborhood located right in the center of Stockholm. The temporary structure is located on the square adjacent to the historic Market Hall in order to enable the traders to retain their existing clientele during the refurbishment. 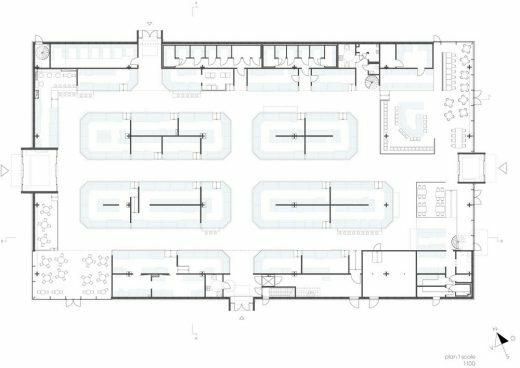 In order to be able to house all the market traders and the associated support functions it was necessary for the building to occupy the entire open area of the square (1970 sqm). 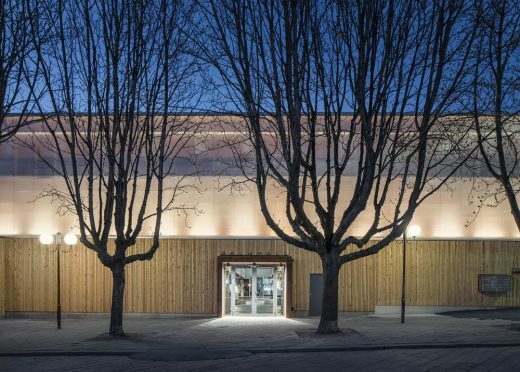 It was therefore important to turn the temporary loss of a much appreciated urban space into a positive addition to the urban fabric by applying considerable care to the design of the building. 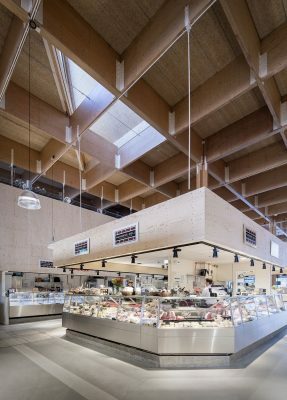 It required a sense of quality befitting the local context and the historic Market Hall while using light weight, cost efficient and sustainable materials befitting the temporary nature of the building. 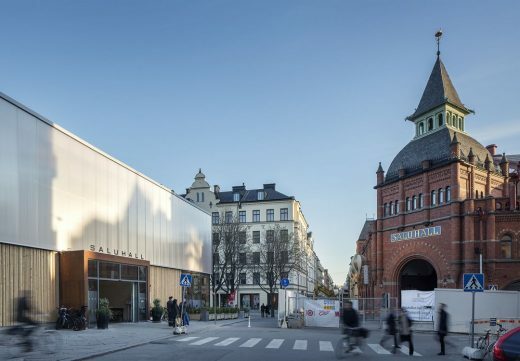 The goal for Tengbom with the conceptual design was to reflect the principles and grandeur of the historic Market Hall while working with modern prefabricated modular techniques. 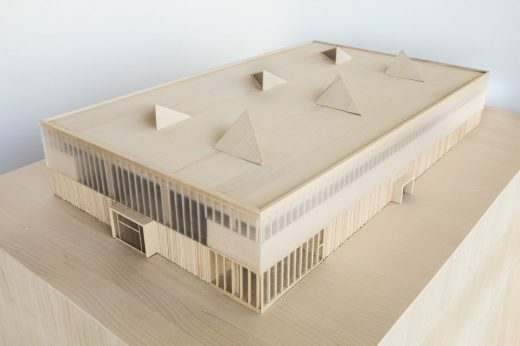 The architects have created a large hall with a generous ceiling height of 9-11m and good daylight penetration from the short facades but also from clerestory lights spanning the long facades and from 6 triangular roof lights. To enable level entry access from all sides of the building we decided that the floor slab would follow the slope of the site. 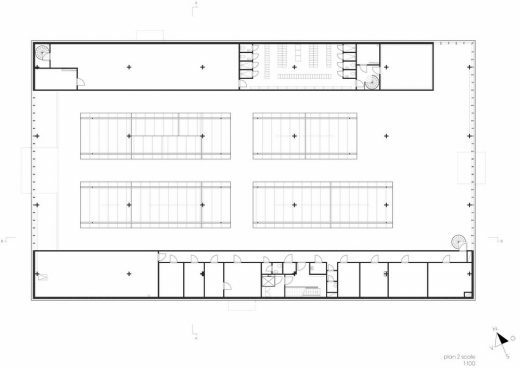 The height difference is 1.9m from corner to corner and the market stalls which have to have a level work area step down along the slope of the slab. 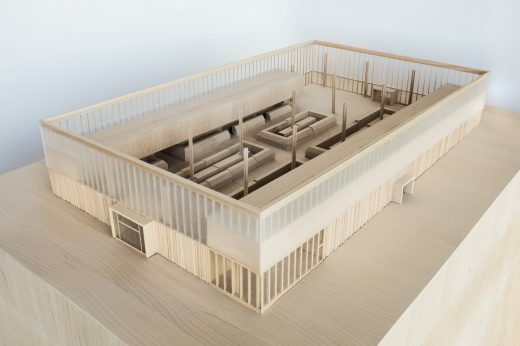 Market stalls, restaurants and storage are located on the ground floor, while kitchens, staff changing rooms and technical installations are located in two long mezzanine boxes. The market stalls are situated along wide, straight thoroughfares and the main entrance faces that of the old market hall on the edge of the square. 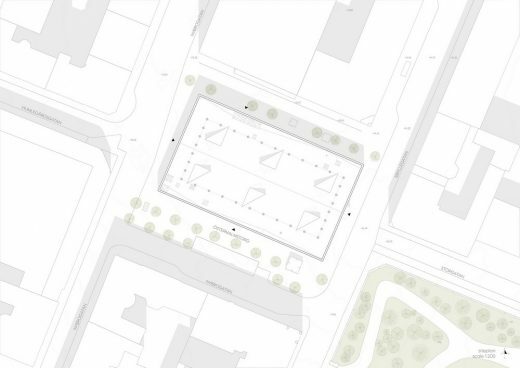 With an entrance strategically located on each of the building’s four facades, the existing flow of pedestrian traffic is able continue across the square through the Market Hall during opening hours. 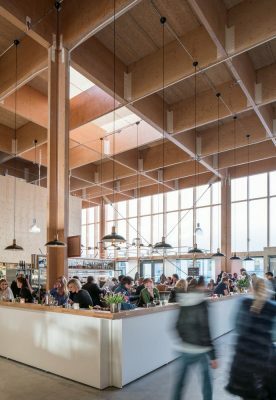 The building has an exposed timber structure consisting of a latticework of glulam beams resting on columns of cross laminated timber. The large scale structure has a modular mounting system that enables quick erection and dismantling with the possibility for subsequent reuse at another location. The choice of timber had a number of advantages. The relative light weight of the structure meant that a minimal concrete foundation was possible saving time and money. It is also a renewable resource with a negative carbon footprint. 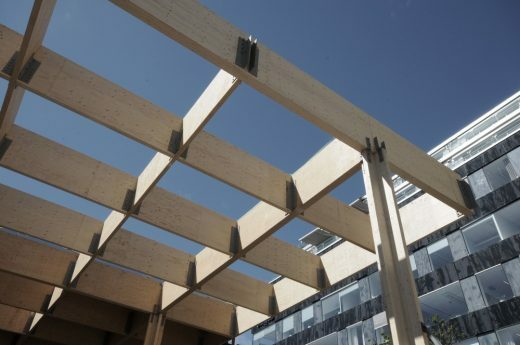 The temporary building’s facades consist of a lower band clad in vertical untreated pine battens of varying sizes. 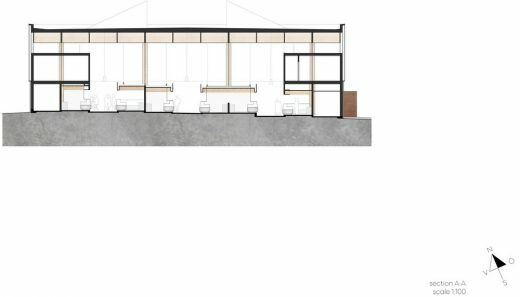 Along the short facades it gives way to glazing providing views into the Market Hall and views out for restaurant diners. 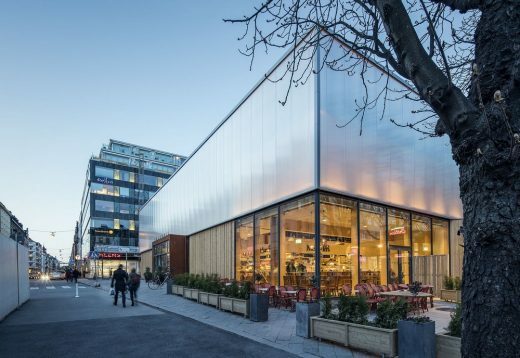 The upper section of the façade is completely clad in a modular system of translucent multiwall polycarbonate sheeting which is light weight and quick to mount and demount. 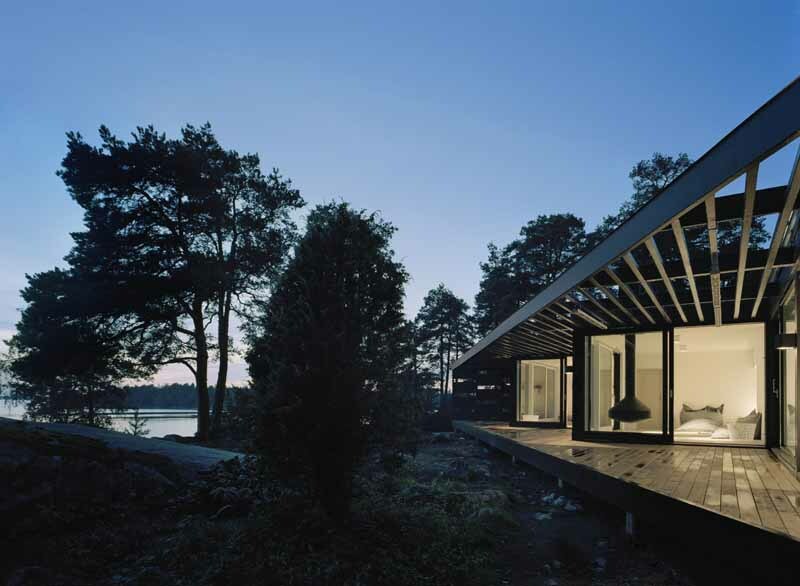 The material has a good insulation value while allowing large amounts of daylight into the building. This effect is reversed at night time when the cladding it is lit up like a glowing lantern illuminating the square and its surroundings.